Week 12 – How to sneak away from the crazy world we live in. I hope to see you at one of the Hay House “I Can Do It“ conferences this year. Check out all the details here. I love that so many of you are interested in developing this practice because it really can have a positive, powerful effect on your quality of life. Meditation teaches us about the mental habits that undermine our desire for a peaceful existence. Turn off the ringer on your phones and eliminate any interruptions if you can. Find someplace comfortable to sit upright (preferably with your back supported). Set a gentle-sounding alarm to go off in ten minutes. Choose a word you’d like to focus on and keep using this same word each time you meditate. I use the word “peace” because that’s the state I’m interested in cultivating. Pick a word that feels right to you. Close your eyes and imagine turning your energy and attention inward. Breathe, relax, and keep bringing your attention back to the present moment by focusing on your word. You might repeat it to yourself, see it before you, or even imagine writing it in the air. Keep doing this until the alarm goes off. It’s really that painless, until you start sitting still, because the practice of presence is sure to bring up everything unlike itself . That said, with a little discipline and commitment, I have no doubt you’ll be able to harness your busy mind in no time. So, to support you in developing this new habit, I’m going to attempt to give you an idea of what the experience is like. I’m going to meditate for ten minutes right now and then write about what happened. My legs feel cramped. I should have sat somewhere else. Did I remember to turn the ringer off on the phone? Maybe I should stop and check. Damn, I forgot to order the supplements I need from Amazon. Yeah, I’m sure I turned the ringer off on the phone. I wonder if I have a busy week coming up. I really don’t have time to meditate right now. I have a lot to get done today. Hmm. I’m feeling more relaxed. I’m looking forward to having dinner with Carolyn tonight. Running to-do list kicks in. Bringing attention back to my word. Energy moving inward and down. I wonder how much time has passed? Breath slowing down, feeling more centered. Feeling at one with myself. That’s it. The minute or so of deep peace at the end was worth hanging on through all the mental chatter. The object of the game is to return to your word each time you get distracted and to stay put until the alarm goes off. I swear if you do this once a day for a week, you’ll experience the power of presence and you’ll start using it to your advantage on a regular basis. 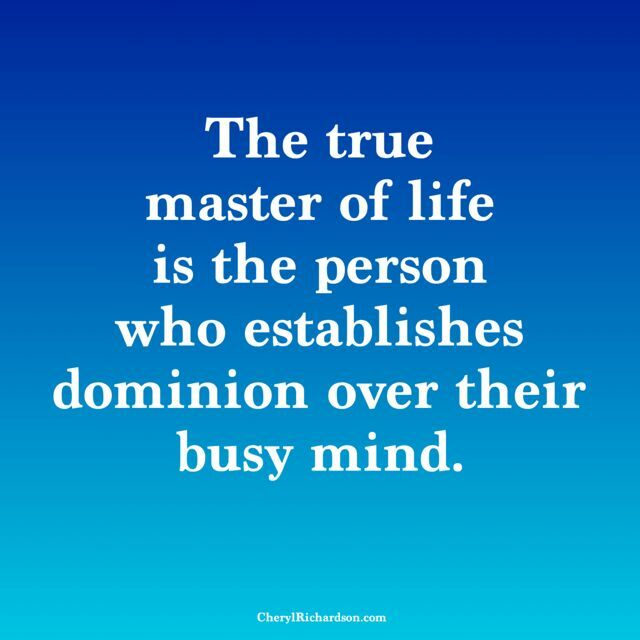 Today I meditate to establish dominion over my busy mind so I have access to peace whenever and wherever I choose. I think that’s pretty great! Go ahead and sneak away from the world . This week’s video is adorable. Check it out here.